Take advantage of interest rates with this encouraging REIT. Some investors appear to be concerned that rising interest rates could hurt real estate investment trusts, but this shouldn't make you turn your back on this great asset class. Investors concerned about the impact of interest rates on REITs posit that even a slight jump in interest rates will heighten borrowing costs, which will then eat into REITs' bottom lines and impede their ability to pursue acquisitions. We remain convinced, however, that the strength of the housing sector is prominent enough to offset the potential complications that could arise from an increase in interest rates. What's more, the correlation between rate hikes and REIT performance may not be as strong over the long term as we have been led to believe. The most important things to take into consideration, even more so than interest rates, are the dividends paid out by a particular REIT and the growth of cash flow. For the most part, these numbers are trending in the right direction. Although interest rates could hurt the short-term prospects of REITs, it's unlikely that they will hurt them over the long haul, especially when real estate is in such a good place. That said, you don't have to take my word for it, but rather hedge your bets. It's entirely possible to invest in REITs that aren't as susceptible to interest rate hike ramifications as the rest of the industry. In fact, there is one REIT that appears to be more than ready to weather the storm of a rate increase and still produce encouraging dividends: Blackstone Mortgage Trust (BXMT - Get Report) . 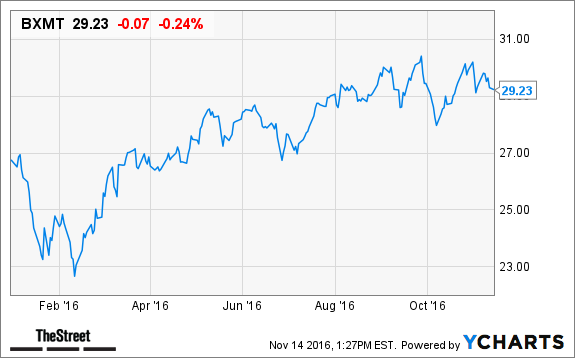 Instead of worrying whether your REIT investment portfolio will be hurt by a rate hike, consider the prospects of Blackstone Mortgage Trust. According to the company's own website, Blackstone Mortgage Trust Inc. "is a real estate finance company that originates and acquires senior loans collateralized by properties in North America and Europe." It's worth noting, however, that originating and acquiring senior loans is far from the only reason Blackstone Mortgage Trust will be able to weather an impending mortgage rate increase. For what it's worth, the best thing Blackstone Mortgage Trust has working in its favor is its excellent manager: Blackstone Group's (BX - Get Report) real estate unit. The affiliation with Blackstone Real Estate means Blackstone Mortgage Trust likely will be shielded against impending interest rate hikes. Blackstone Real Estate is one of the world's leading investment and advisory firms, which controls more than $180 billion in real estate. As such, Blackstone Real Estate provides Blackstone Mortgage Trust with invaluable property and market information -- not to mention proprietary deal flow. As a subsidiary of the largely successful Blackstone Real Estate, Blackstone Mortgage Trust is made privy to credit advantages few REITS can claim. With the support of Blackstone Real Estate, Blackstone Real Estate Mortgage is able to capitalize on cheap and favorably structured financing options. It's also worth noting, however, that most of Blackstone Mortgage Trust's loans based using LIBOR, which is currently the world's most widely-used benchmark for short-term interest rates. The short-term nature of said loans helps to insulate assets from near-term interest rate fluctuations. Currently boasting a dividend yield of 8.5%, Blackstone Mortgage Trust is already producing encouraging results for those who bought in at the right time, but it's worth noting that the Federal Reserve's recent announcement of an impending interest rate hike could actually increase Blackstone Mortgage Trust's already impressive dividend yield. Few REITs producing a dividend yield that high, at least that I am aware of, stand to benefit from an interest rate hike quite like Blackstone Mortgage Trust.